Saturday was the last indoor Farmer’s Market at Old Trail School. While I’m happy that the Farmer’s Market continues outdoors at the Howe Meadow in May, I will miss the challenge of the winter farmer’s market. What challenge, you ask? Well, the winter farmer’s market is smaller, which means less vendors, and of course, in the winter in Ohio, there is less produce to be sold. I’ve learned that to get the best haul, it is necessary to get there early and wait for the market to open. Here’s my favorite part – they open the market by ringing a cowbell! As soon as the cowbell rings, all the people eagerly lined up at the door surge forward with one goal – get the carrots! Or greens. Or radishes. Or whatever it is that looks the freshest, the most crispy – and get it before it’s sold out! I’ve got this down now – as soon as the bell rings, you bypass the vendors on the first floor (coffee, tea, prepared foods), go past whichever musician is providing music this week, and head immediately down to the gymnasium of the school. This is where the good stuff is! Ignore the cheese, the bread, the pasta – it’s not going anywhere. Instead, push (politely) through the crowd to the back of the gym and the produce vendors. This week, I grabbed Siberian Kale, mixed salad greens, two bundles of tiny beautiful carrots, and a bunch of ramps from one vendor, plump red radishes from another, and lovely bok choy from a third. Veggies done! 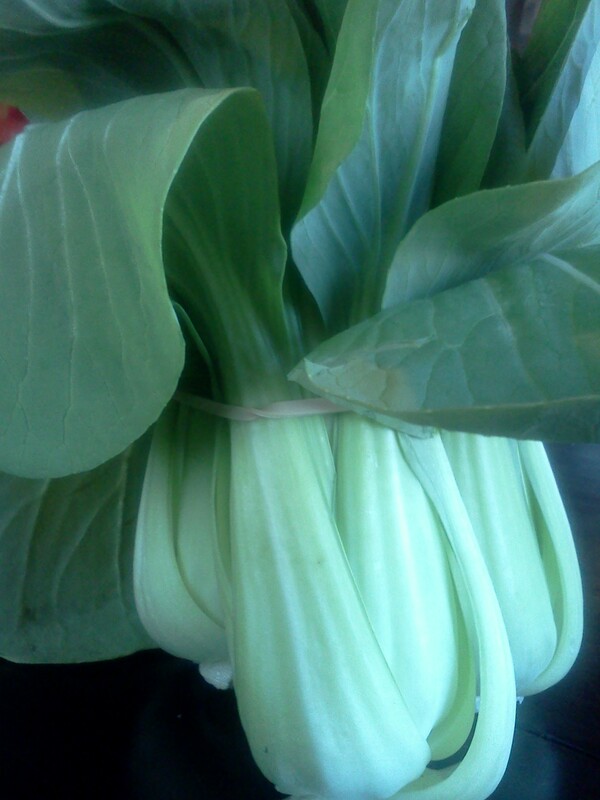 Isn’t the bok choy lovely? 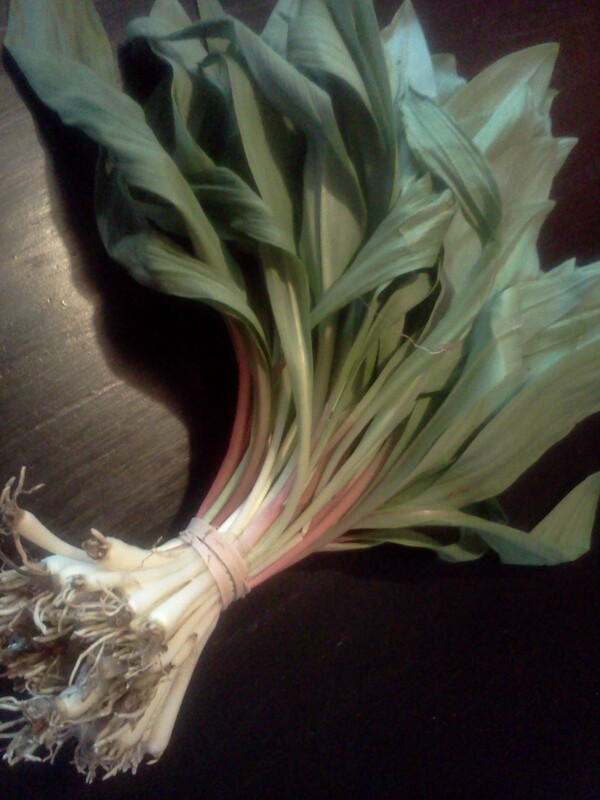 Ramps! I’ve never cooked with these before, so it should be an adventure! Next – eggs. There is no comparing a supermarket egg to a fresh, local egg. It’s just no contest! Fresh and local wins hands down every time. The eggs have better color and unbelievable flavor. 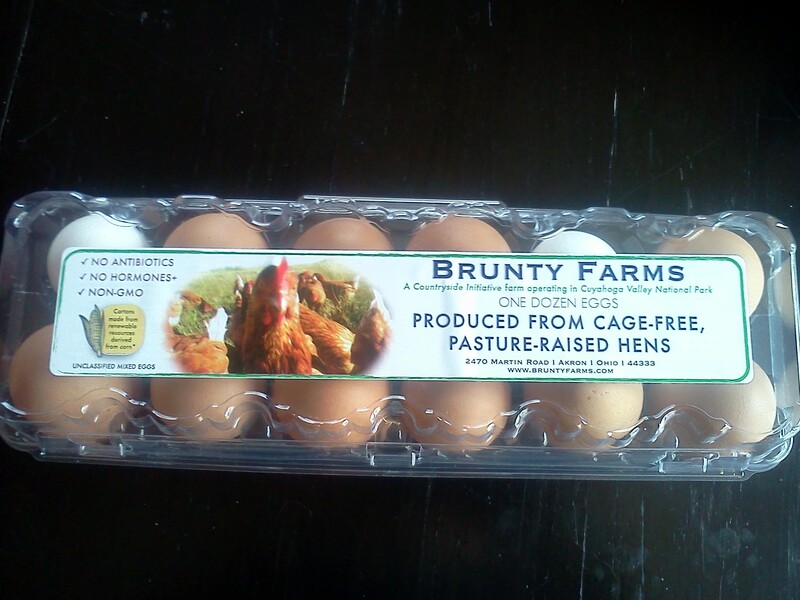 Nothin’ beats a farm fresh egg. I’ve been thinking a lot about what I eat and why. If I look honestly at what I’m eating now compared to what I ate a year ago, I can say that I eat more vegetables and much less processed food. Whenever possible, I am buying and eating locally grown produce, and spending very little time and money at the conventional grocery store. Can I get better? Of course – and I’m continuing to work at it. One reason that I love the Farmer’s Market and my CSA is that I like to know where my food come from. I get to meet the people that grow what I’m eating, and what’s cooler than that? However, I’ve realized that I haven’t applied that same philosophy to the meat that I eat. I’m not going to lie – I like meat. But when I buy a steak or a pack of chicken from the grocery store, what do I really know about what I’m putting in my body? Not much, that’s for sure. I’m lucky to have places like Brunty Farms to get locally raised chicken, pork and turkey, and like Dumas Meats, where they raise the majority of the beef that they sell. I need to take advantage of that. Whoops – made a bit of a speech there, didn’t I? Let’s get back to what I cooked – and ate – this weekend. Saturday, we grilled the brats from Brunty Farms. 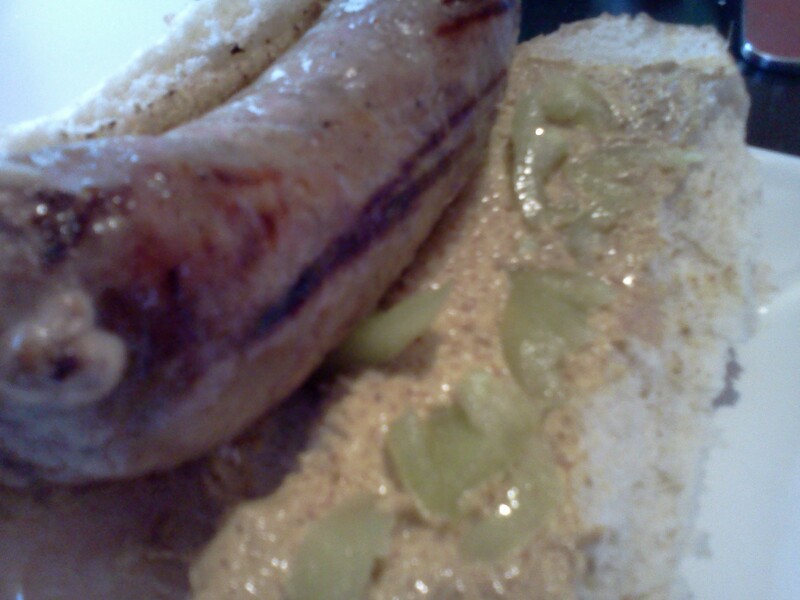 The apple brats were a little softer, with a slightly sweet taste from the apple that went well with the spicy mustard and hot peppers (the only way to dress a brat!). The beer brats had that awesome snap! when you bit into it, and the flavor was amazing. I’ll definitely be buying those again! The radishes also bit the dust on Saturday – Brian demolished both bunches in one sitting as an afternoon snack. 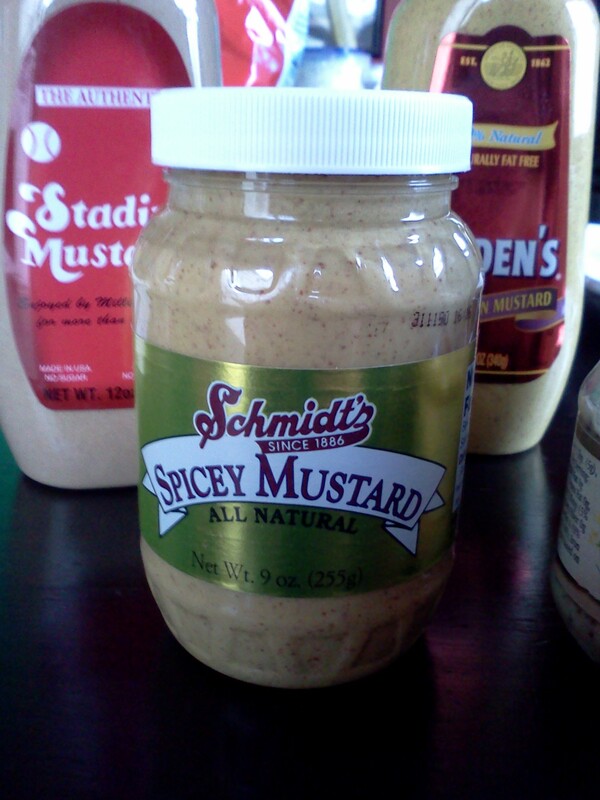 Spicy mustard from the Schmidt House in Columbus, Ohio. You have to put German mustard on a brat! 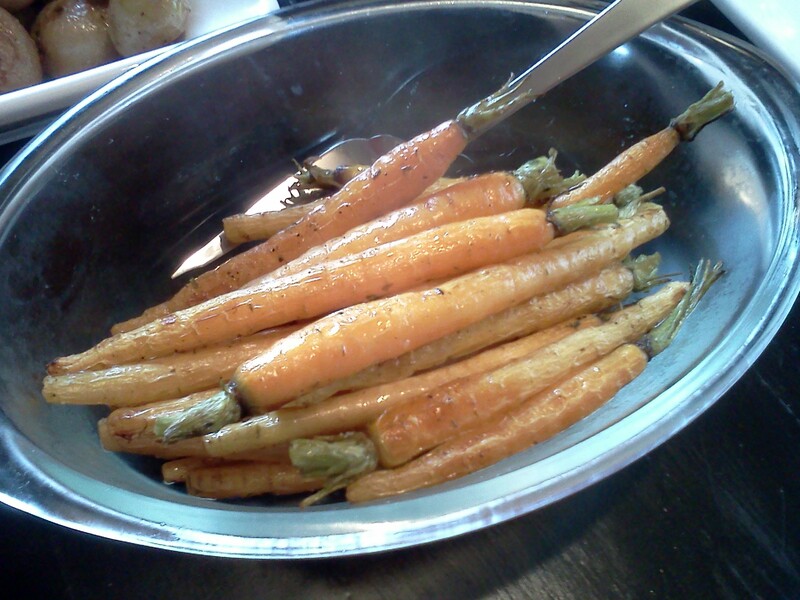 Then, I tossed the carrots in olive oil, salt, pepper and some Penzey’s Bonnes Herbes mixture. 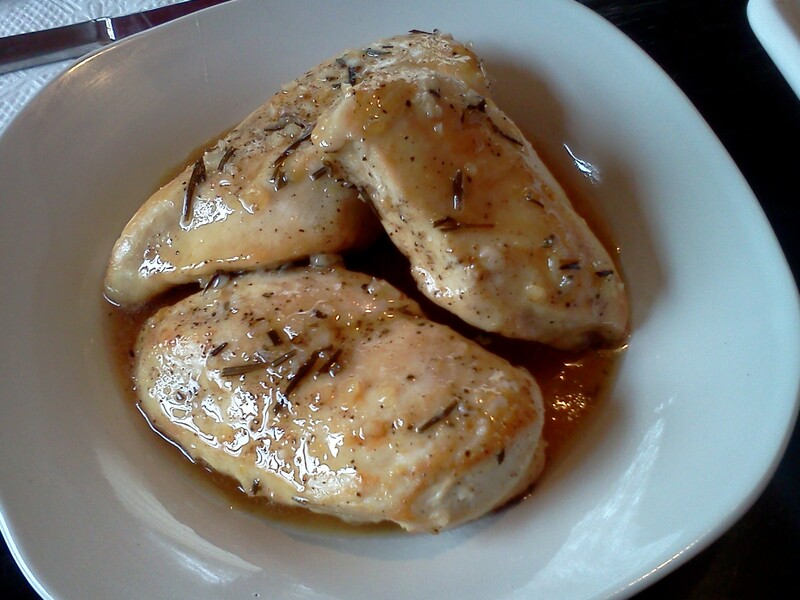 I roasted them in a 400 degree oven for 25-30 minutes – just until they were tender. Conveniently, the potatoes took almost the same amount of time to cook. 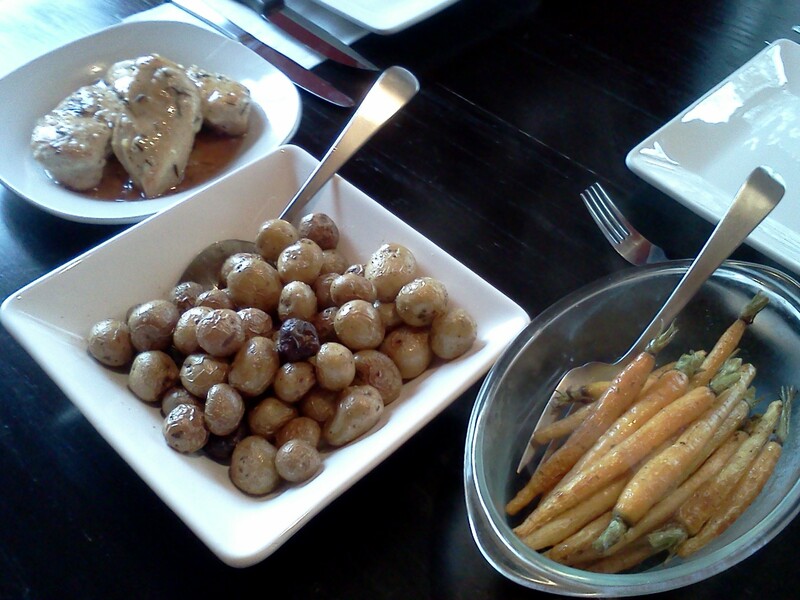 The roasted carrots were delicious! 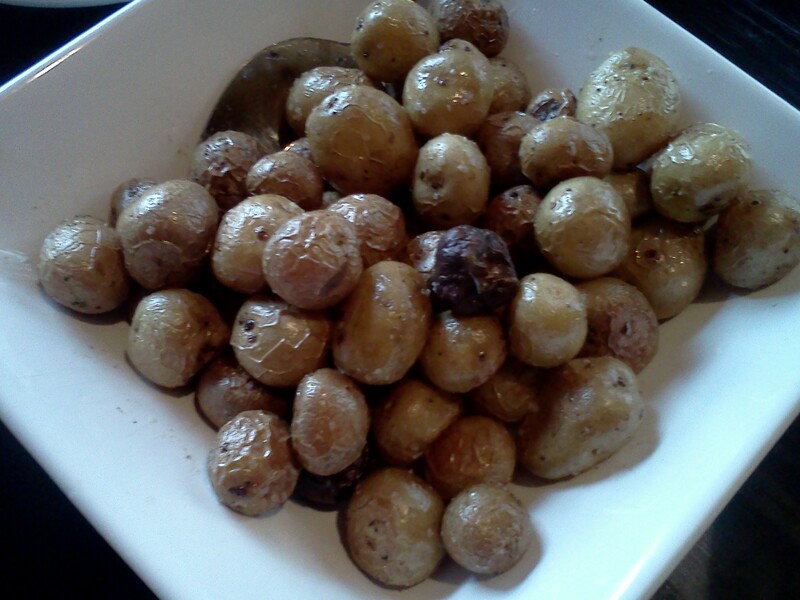 The tiny potatoes were so cute! It was a good weekend for food. This entry was posted in Dinner, General and tagged brats, brunty farms, carrots, dumas meats, farmer s market, farmer's market, old trail school farmer's market, spicy mustard on April 30, 2013 by Melissa. You are so right about eating locally and knowing where your food comes from. I love to go to Farmers Markets for that reason also. Does just feel better, cleaner for some reason. I LOVE cooked carrots and never think about roasting them like I do other veggies. Usually make them in some crock pot recipe. The young ones look delicious. Thanks for all the great ideas! Roasted carrots are delicious! Somehow, carrots in the crockpot feels wintery, but little roasted carrots seem like a springtime dish. Crazy, huh? It looks like it was a good weekend for food–yum! I’ve ventured to the farmer’s market a few times over the winter–most recently as I was out of honey and maple syrup–and it is definitely a party/social event as much as or even more so than a place to obtain local produce. The one back in Falls Church, VA was also, now that I think of it. Local honey is the best! I love the social part of the farmer’s market and I feel so lucky to have one available year round. That is a great weekend for food. I get exactly how you feel about farmers markets including the excitement in making great food with it. The extra energy and health burst that comes with eating less processed food doesn’t hurt either. I’ve got a bunch of little bitty farmers market carrots hanging out in the fridge right now. I was going to peel them, but maybe I’ll skip that step. Great tip. Thanks, Meghan! I definitely feel better and have more energy when I eat better food. I couldn’t stop staring at the lovely bok choy and the baby carrots. 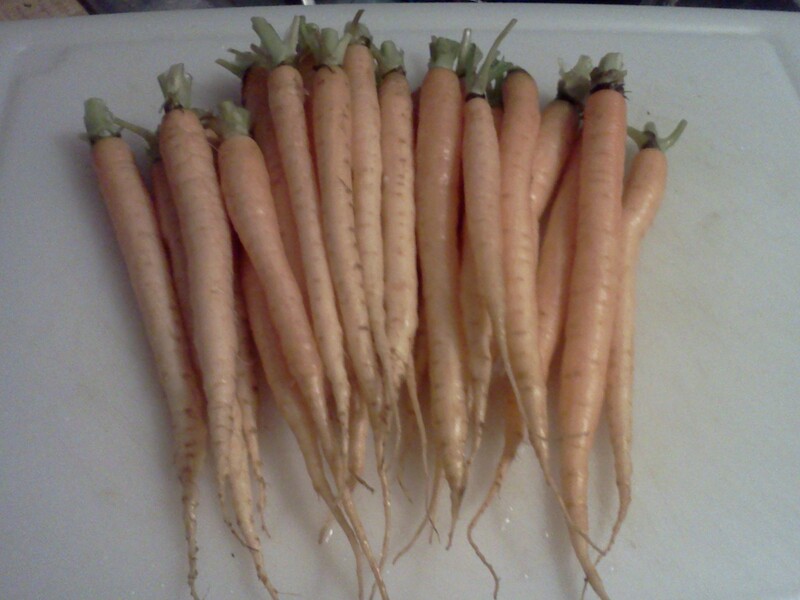 We don’t get carrots in our CSA box very often, but when we do I am so happy! We didn’t do that well eating fresh and local this winter, but we are so excited for our Farmer’s Market to be outdoors again. I love it so much and it does help you think about what you are eating when you have a relationship with those who grow your food! The carrots were fantastic! I can’t wait until my CSA starts again, but I’m glad to have the farmers markets in the meantime. What became of the ramps? I’ve used them in pastas and a stir-fry. They’re really good – sort of a cross between a leek and a scallion, but with a milder onion flavor. I adore carrots cooked that way. I use the tops to make pesto and then toss the roasted carrots into pasta with the pesto. That sound wonderful! I have never thought of using carrot greens in pesto. Do you use any herbs as well, or just the carrot greens?